Vermont Quarries’ Danby Quarry, inside Dorset Mountain, is the biggest underground marble quarry in the world, over a mile long with a footprint of twenty five acres and reaching six levels deep. To the first time visitor, endless dimly lit galleries with thirty foot ceilings supported by massive roof pillars create a sensation of trespassing in a dusty subway tunnel for giants. Ten-foot marble chainsaws, massive loaders racing winding roads over the “hills” in the quarry and a brand new gang saw big enough to park a small car inside all support this impression. Everything in the quarry is built to match the scale of the smallest unit of work, the twenty ton block of marble. According to Luca Mannolini, the quarry’s general manager, a $2 million investment by quarry operators in a stone fabrication facility inside the quarry has insured the future availability of Vermont’s Danby marbles. 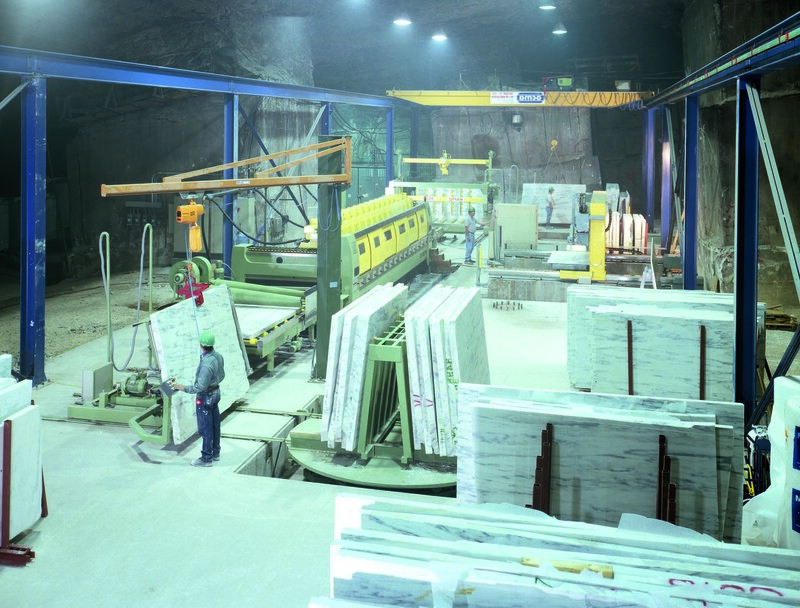 Formerly, stone produced at the quarry was shipped in blocks to Italy for fabrication, but it can now be processed on site for better selection, lower cost and quicker scheduling. Luca Mannolini is a native of Carrarra, Italy, the traditional capitol of marble production and a region where marble has been worked since Roman times. He has helped to develop world class technology at the quarry and cites the brand new production line as evidence of Vermont Quarries’ long term confidence in the continued growth in demand. Five varieties of marble are produced at Danby Quarry. Through the six levels, they can access every layer of the geologic formation that formed Vermont’s Marble Valley, thereby approximating material from almost any historic quarry in the region. BREAD SLICER. 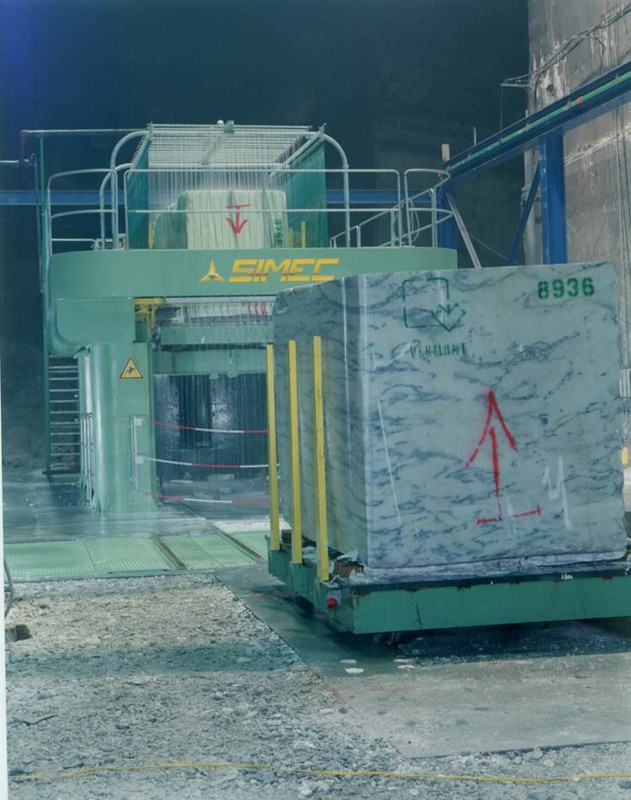 This new 80 gang saw is about to be drawn through these two twenty ton blocks of marble, the work of about one shift. Note the pitch of the blocks, set by the grader to obtain the best cut from the stone. A tour of the grading, slabbing and finishing line at the quarry includes a number of current projects which demonstrate how history continues to drive demand for Danby marble. This is nowhere more apparent than in the quarry’s ongoing contracts with the Veteran’s Administration. Luca Mannolini shows us slabs of honed Olympian Danby white marble being sawn into niche covers for marking remains in mausoleums. This relationship goes back to 1866 when a local “Gettysburg” quarry got the exclusive contract to furnish monuments to the Union dead in the newly opened Arlington Cemetery. At the end of the finishing line, ready for shipment, were leaning a matched series of toilet partitions cut out of a single block of Imperial Danby. These are destined for a new gym at the 1909 Russell Senate Office Building in Washington, DC. Although part of a new facility, the choice of Danby marble here was determined by its original use elsewhere throughout the structure’s interior. Sitting beside them were a quantity of 3 ½ inch thick honed veneers produced for a new addition to the 1928 US Court of Appeals in Albany, NY. This building was constructed with Imperial Danby, but some very large federal projects, such as the 1932 US Senate building, present a more promiscuous range of varieties. Whether this laxity was the result of the pressures of production (the building would represent a year’s output for the quarry) or a lack of awe for the material in the face of so much of it, it is clear that standards have risen. Rigorous grading and cutting choices make the most of every block produced by the quarry today. In the grading area, blocks of Imperial Danby sat waiting to be sawn into slabs for veneer and pilasters for the restoration of the 1907 Italianate retail “palace” built by the jeweler Tiffany’s on Fifth Avenue in New York City. Victim to a modernization fifty years ago, the storefront level pilastered facade had been removed and replaced with a continuous band of black granite. 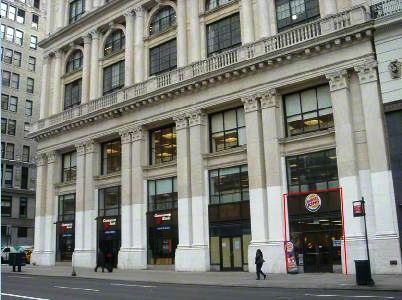 Danby marble is not original to the project, but the architect felt that it was a credible match for the Hudson Valley marble contiguous above, now no longer available. In the estimate of Luca Mannolini, there is enough marble left inside Dorset Mountain to rebuild the world’s entire existing marble built environment. You can find a list of more stone quarries in the Boston and Beyond Directory. This entry was posted in Stonework and tagged Marble, New York, Quarry, Vermont. Bookmark the permalink.